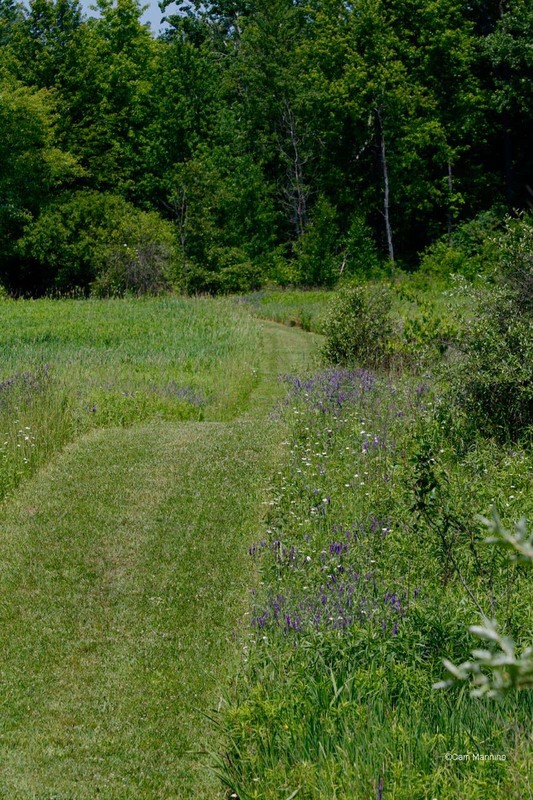 Strolling through the old farm fields of Cranberry Lake Park in summer is an auditory feast. The canopied paths and wide open fields as well as the shady, moist wetlands celebrate summer with a full-throated chorus of birdsong – the quick sweet notes of the Yellow Warbler, the high-pitched trill of the American Redstart, the melodious song of the elusive Warbling Vireo. 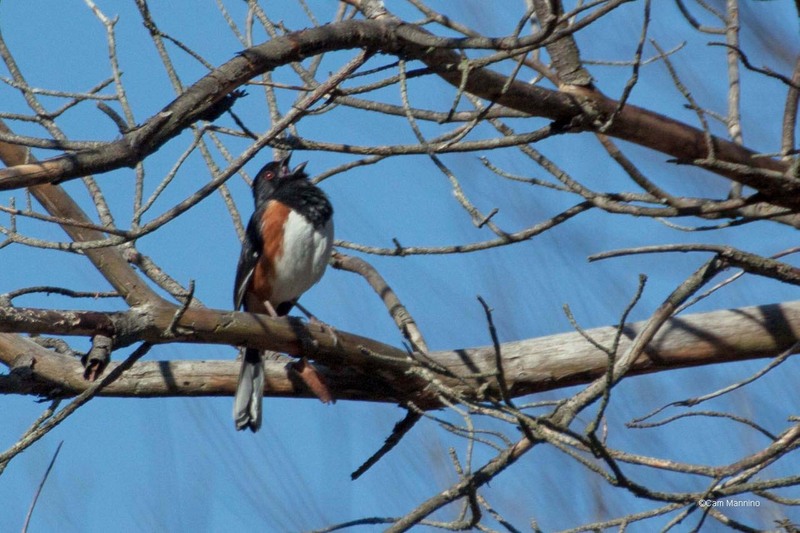 Ben’s birding group reports more than 50 different bird species on one spring visit, more than in any other park in the township. So you’d expect this week’s blog to be filled with bird photos, right? Uh, not quite. Oh, I do have bird photos to share but some will come from other times and places in the township because birding in Cranberry Lake right now is more by ear than by sight. Birds dive into tangled brush or tall grass or disappear among the whispering leaves overhead to make nests, feed young, intent at the moment on propagating their species. So they’re not all inclined to pose for photos. 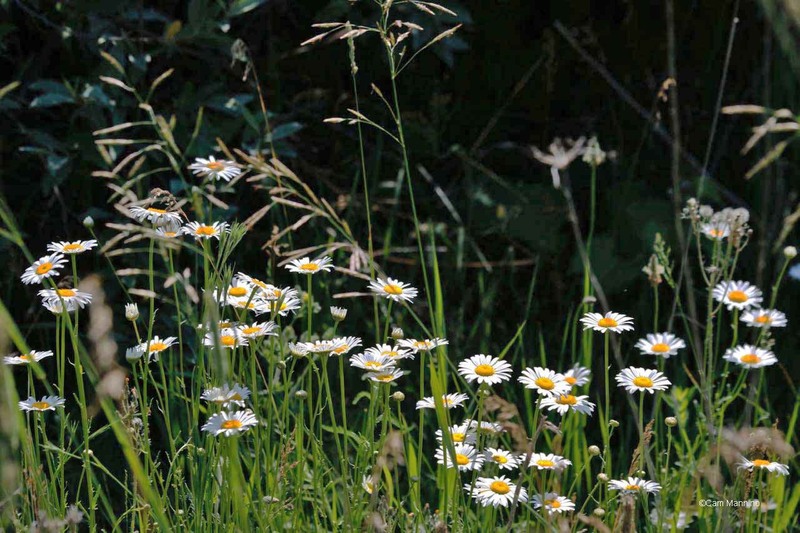 Luckily, dragonflies, butterflies, grasshoppers – all sorts of insects – do. And of course summer flowers are very obliging when a breeze pauses for a moment. So let’s set off together with eyes and ears alert to see what this historic farm has to offer. The Axford-Coffin House, at one time a working farm and a country retreat, is now surrounded by a 213 acre park. 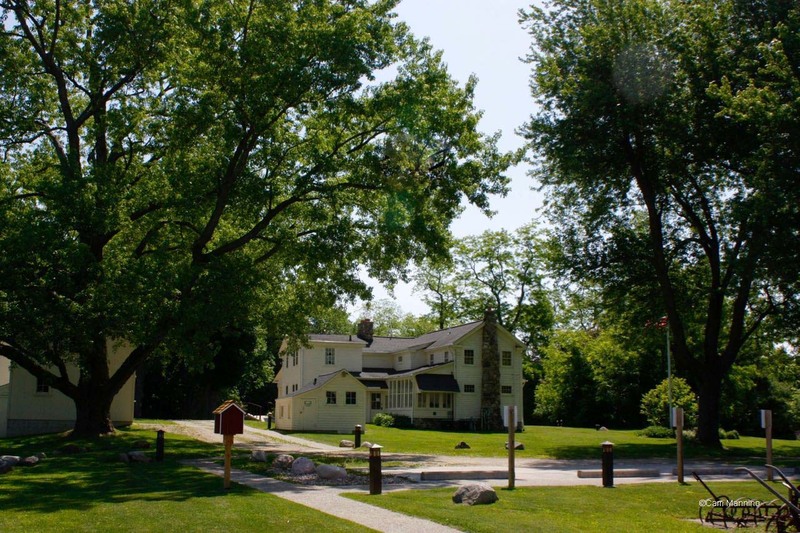 The lovely Cranberry Lake Farm Historic District on West Predmore Road is a township treasure and listed in the National Register of Historic Places. If you haven’t explored its beautiful grounds, I recommend you begin by taking a visual tour and learning about its history at this link. We, however, are off to explore the southern part of the 213 acre park that once was a working farm. As we head off along the path from the parking lot that’s west of the historic home, we’re surrounded by knee-deep grasses and wildflowers. 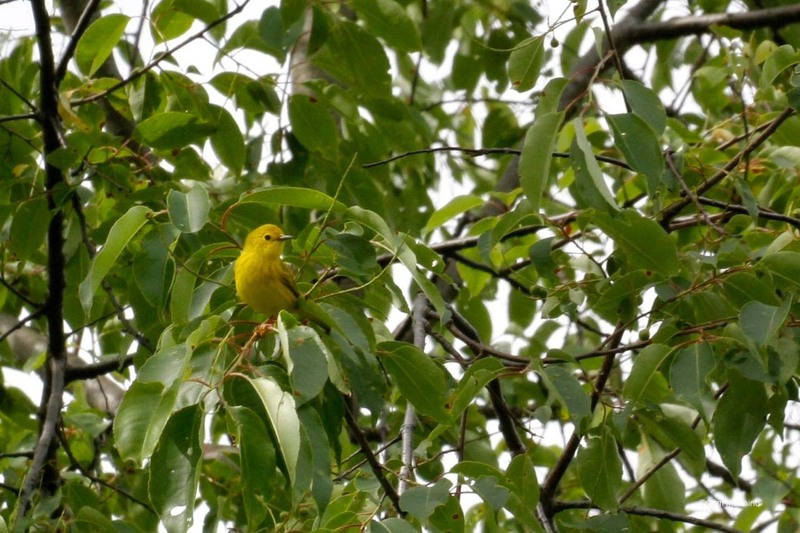 Tiny Yellow Warblers (Setophaga petechia) are whisking in and out of the large bushes or small trees nearby, still singing their quick “I’m a little sweet” songs as in Antonio Xeira’s recording here. This male with his rust-streaked breast actually paused long enough for a photo! And another male Yellow Warbler nearby was busying bringing home lunch for his mate or maybe some nestlings in a distant bush. 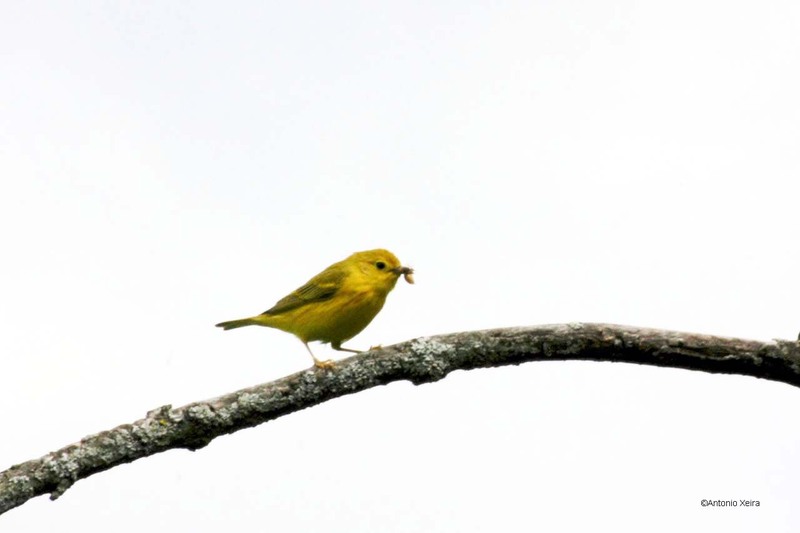 Male Yellow Warbler taking food back to the nest. On three different visits in the last 10 days or so, I heard or saw a male American Redstart singing in the same tree at a fork in the trail. I’m thinking he and his mate must have a nest nearby. For some reason, I’d never seen this bird before and he’s a beauty. There’s a good closeup of him here at the Cornell Ornithology Lab. His song is thin, high and ends abruptly. Cornell Lab says its sometimes described as sneeze-like! Page down at this Cornell link to hear his song. 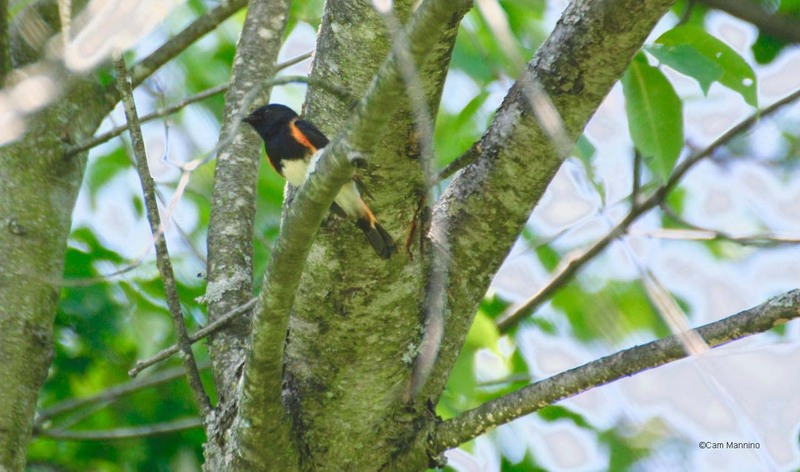 A male American Redstart sang in the same tree on three separate visits. Wish I could spot its nest! 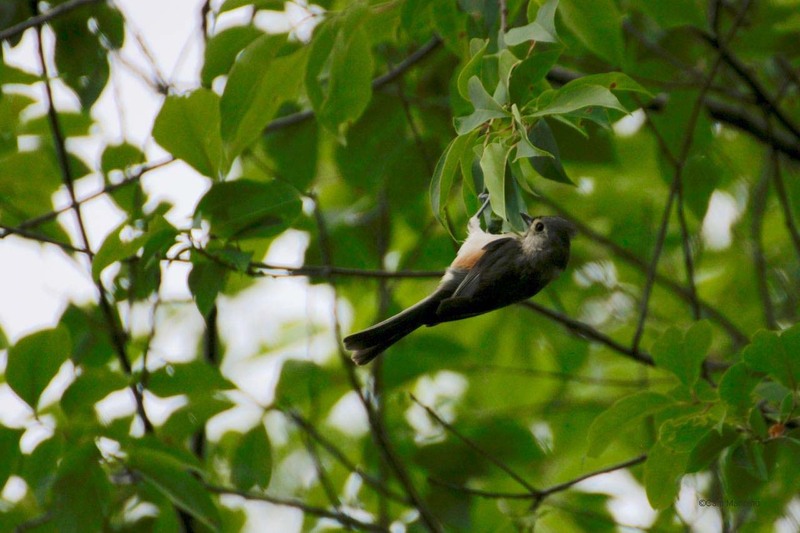 In the same tree one morning, I saw a Tufted Titmouse (Baeolophus bicolor) swinging at the tip of a branch as it tried to harvest something from among the leaves. At this time of year, omnivore birds like the Titmouse are probably looking for protein for their mate or young, so perhaps he’d found a caterpillar? A Tufted Titmouse swung from the tip of a branch searching diligently for something it wanted to eat. As I crossed the southern old field, going north, two Common Yellowthroats (Geothlypis trichas) announced their territories, calling back and forth across this grassy meadow. Yellowthroats have the distinction of being one of the first New World birds catalogued in 1766 by Carl Linnaeus, the famous biologist who created the Latin classification system for all life forms. My photo of the Yellowthroat is below but for a clearer photo of this masked bandit, look here on Cornell Lab’s website. The black-masked Common Yellowthroat is tough to see but easy to identify from its “Witchedy, witchedy” song. 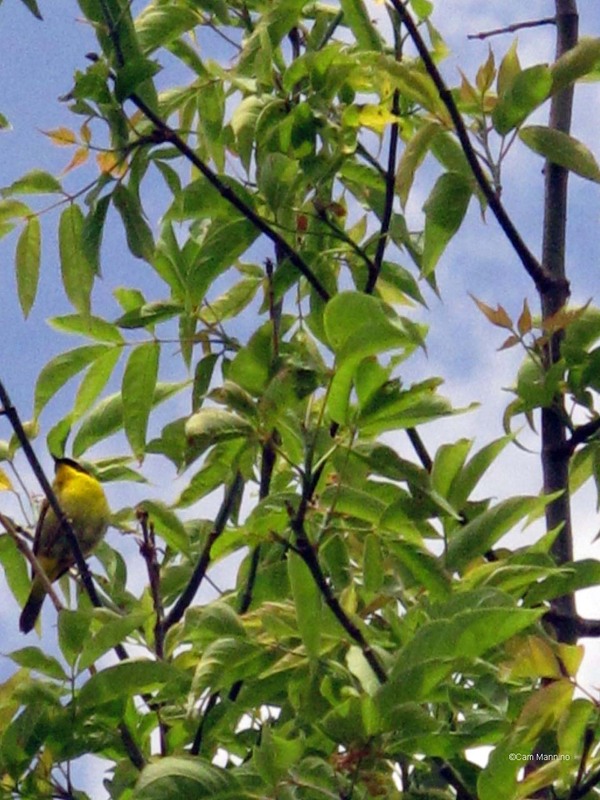 I rarely see Yellowthroats up close but you can hear their “Witchedy, witchedy” songs all over Cranberry Lake Park. Turn your volume up and you’ll hear the singing competition of two males going back and forth twice on my 25 second recording. 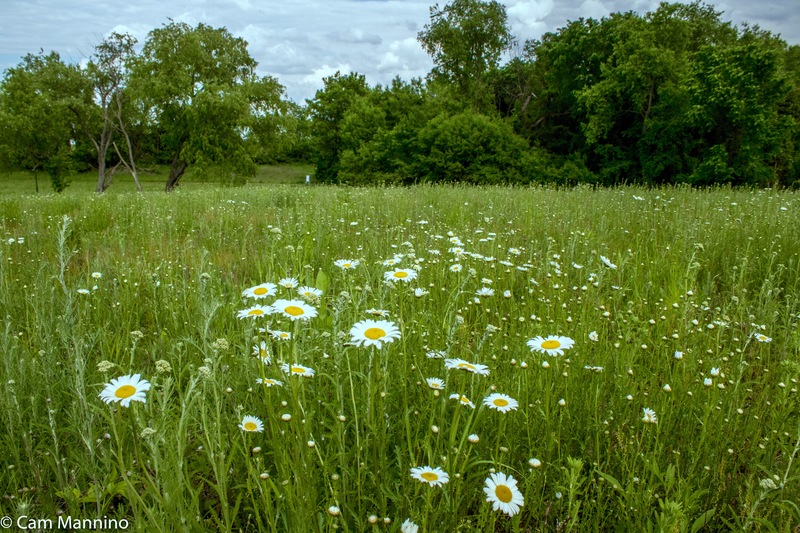 The old farm fields at Cranberry Lake exemplify the changes that happen over time when forage crops thrive in abandoned farm fields which are also surrounded by neighboring gardens filled with cultivated flowers. Sensitive Fern (Onoclea sensibilis) so called because it shrivels with only light frost. The rosy stems of native Dogbane or Indian-Hemp (Apocynum cannabinum) will soon be topped with clusters of white flowers. This plant is toxic if eaten but I doubt you or your dog will be tempted. 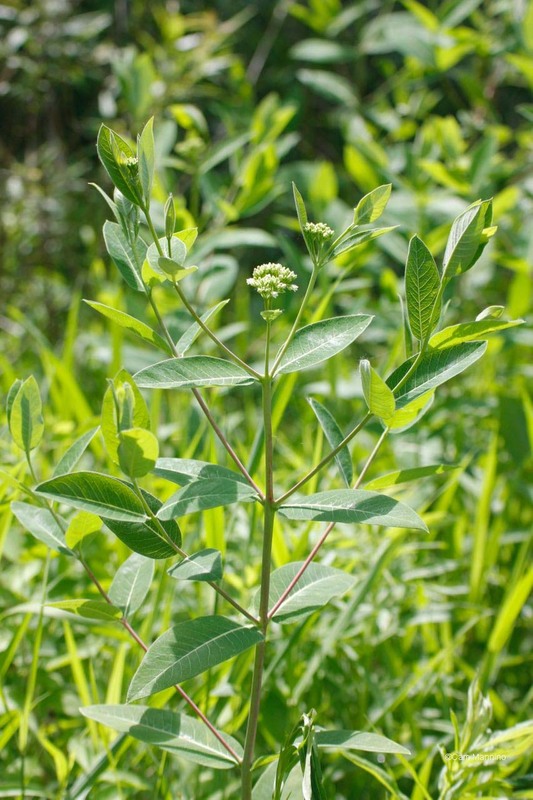 Dogbane, whose stems will get rosier as it matures, is a lovely native plant that is toxic if ingested. 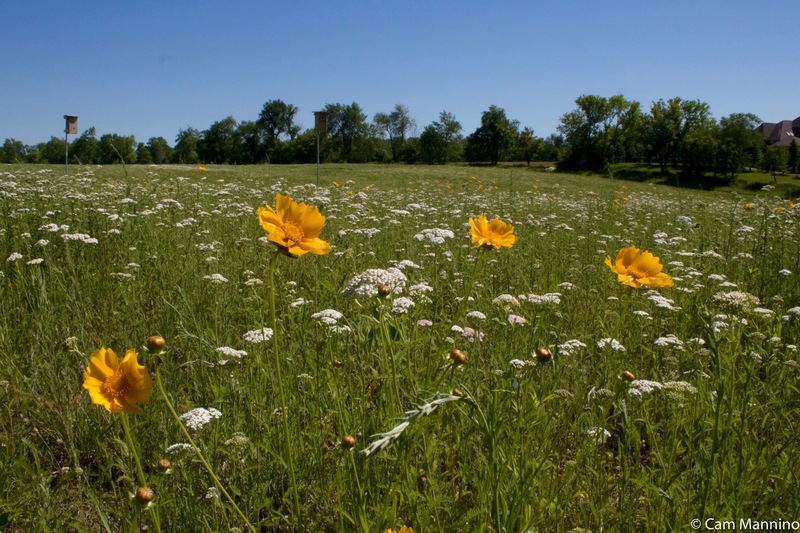 The meadows are full of non-native plants that, over the years, have found their way into Michigan’s former farm fields. Many of them are good neighbors, existing side-by-side with native plants without crowding out the original inhabitants. I particularly like Orange Hawkweed (Hieracium aurantiacum), also called Devil’s Paintbrush (not to be confused with Indian Paintbrush). It can be problematic but isn’t at this point in Oakland Township parks. The Wildflowers of Michigan Field Guide explains that the name came from a mistaken belief that hawks ate it to improve their eyesight! 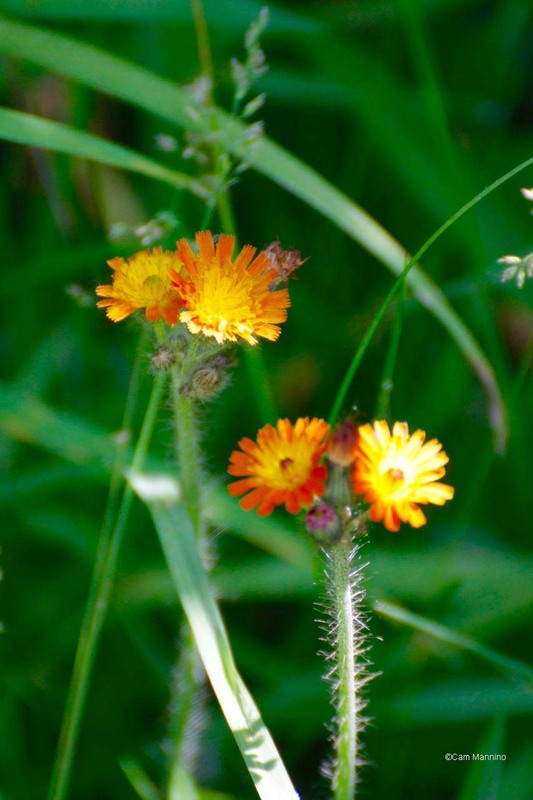 Orange Hawkweed or Devil’s Paintbrush – often confused with Indian Paintbrush. Other non-natives pop up here and there in the old fields at Cranberry Lake. Goat’s Beard blossoms open in the early morning and close about noon. And when its blooming season is over, it makes a huge seed head, like a giant, beige dandelion, which it is doing right now. By the way, the insect on the blossom at left is a Hover Fly (family Syrphidae) which mimics bees or wasps for protection but has no stinger. Goat’s Beard as it looked last month. A Goat’s Beard seed head. Other non-native plants that usually appear singly are White Campion (Silene latifolia) and Rough-Fruited Cinquefoil (Potentilla recta) which is easily confused with some of our native varieties (thanks to Ben for the ID help!). White Campion is non-native, coming from Europe, Western Asia and Northern Africa. Rough-Fruited Cinquefoil comes originally from Europe. Of course, invasive non-native plants have also moved into Cranberry Lake. Here’s a native House Wren (Troglodytes aedon), singing from within one of the worst invasives, the Autumn Olive (Elaeagnus umbellata), a shrub which is native to Asia. These large bushes fix nitrogen in the soil, creating soil conditions unsuitable for native plants. Its berries are spread by birds and animals. It leafs out early and keeps its leaves late into the fall, shading out other plants. In short, it’s one problem shrub! 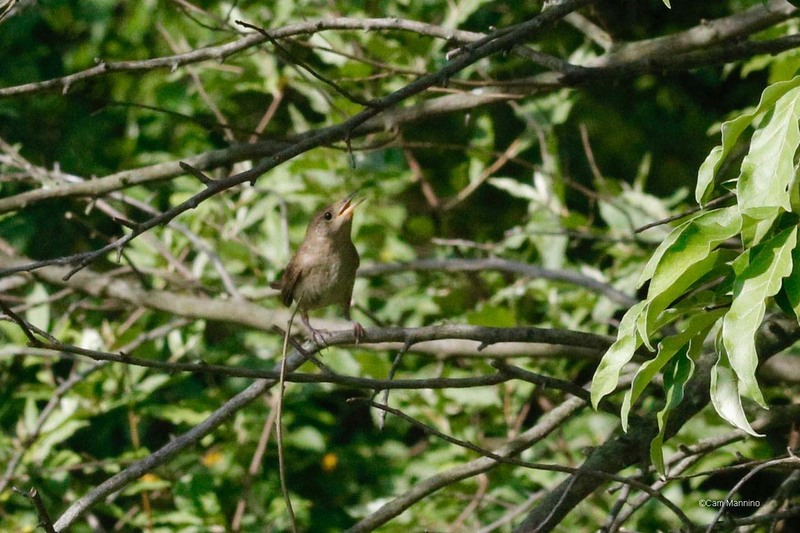 But the Wren is a welcome summer resident and his beautiful, burbling courting song (recorded by Antonio Xeira) is much beloved even if it does emanate from an invasive bush. Another serious invasive shrub grows abundantly in Cranberry Lake, the Multiflora Rose (Rosa multiflora). This admittedly lovely plant loses its appeal when its strong thorns catch your skin, and this gangly shrub happens to be crowding out native plants all over Michigan. That hurts both our plant and wildlife communities by making native species less plentiful and less healthy because they are less diverse. 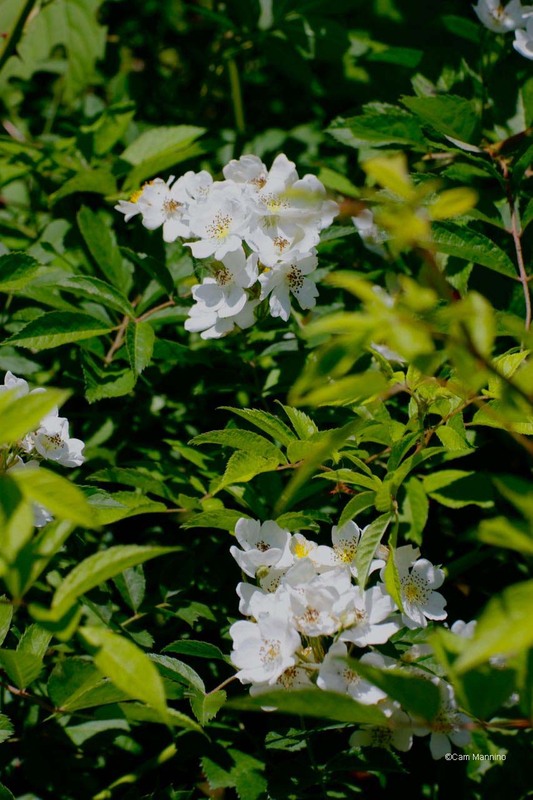 Multiflora Rose was brought to the US from Japan by horticulturists after WWII as a fencing plant and spread quickly from gardens into natural or disturbed areas. Like the Autumn Olive, it unfortunately can grow in sun or shade and has the same means of competing for space – lots of berries spread by wildlife and leaves early spring to late fall that shade out other plants. Hairy Vetch (Vicia villosa) is beautiful, like many invasives, but has a tendency to spread. It was brought here as forage for animals. It isn’t as invasive as its relative Crown Vetch (Securigera varia), which forms dense colonies that exclude other plant species, but it does form smaller colonies and can be seen along the paths at various places in the park. Here a native Bumblebee (g. Bombus) probes the tube-like flowers with its long tongue. 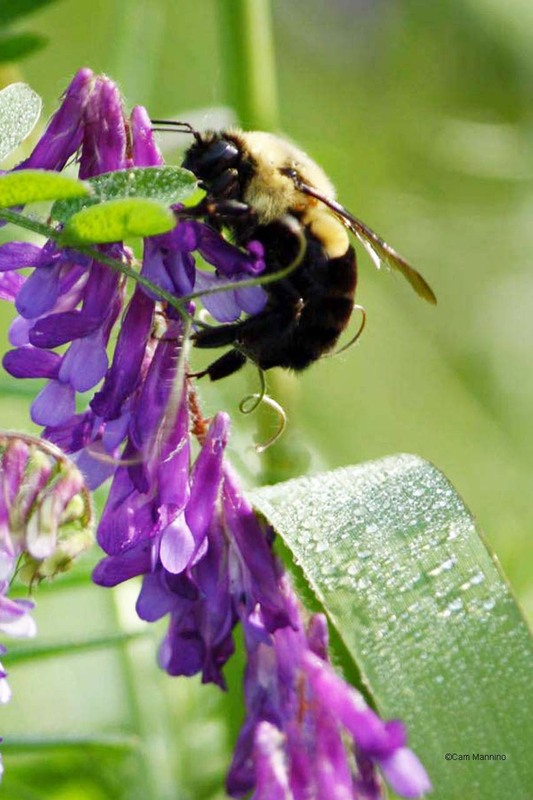 A native Bumblebee searches for nectar with its long tongue on a Hairy Vetch plant, an invasive species. And nearby, a Seven-Spotted Lady Bug (Coccinella septempunctata), a species introduced repeatedly from Europe to rid crops of aphids, looked for a meal on a fellow European, the Hairy Vetch again! At least it wasn’t the Harlequin Ladybug/Asian Lady Beetle (Harmonia axyridis) that infested homes a few years ago. Unfortunately, our native ladybugs, the Nine-Spotted Ladybug, (Coccinella novemnotata) are now rare and scientists are not sure why that happened. 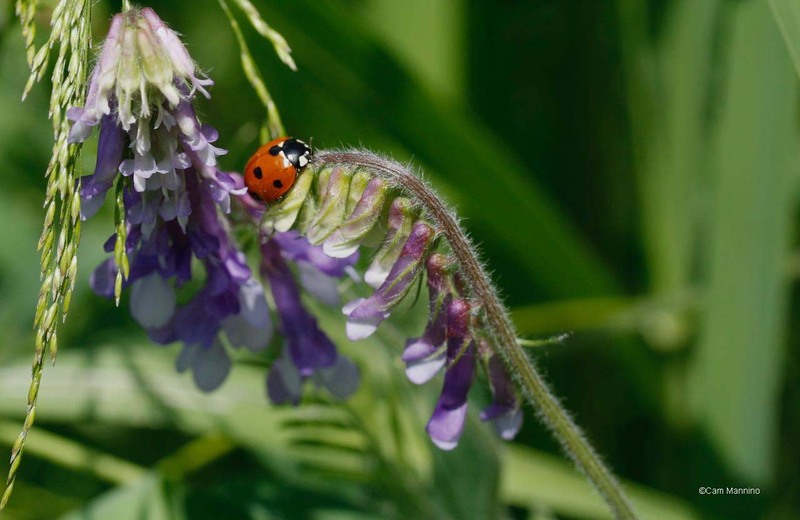 A non-native Seven-spotted Ladybug looking for aphids on a non-native Hairy Vetch plant. Out in the Old Fields: Fancy Bugs! 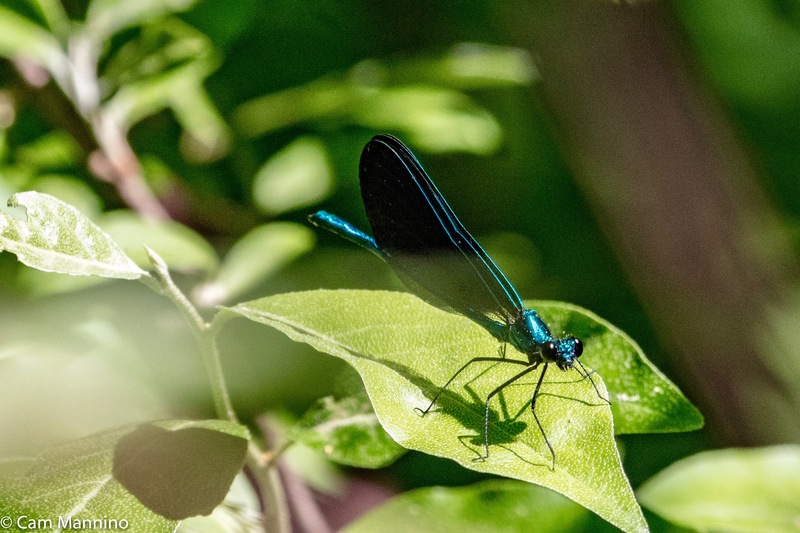 The sun-drenched Old Fields at Cranberry Lake seem to attract unusually interesting insects, including – wait for it – flies! Yes, I’m aware that flies aren’t as immediately appealing as butterflies or as impressive as dragonflies, but some really are pretty cool. 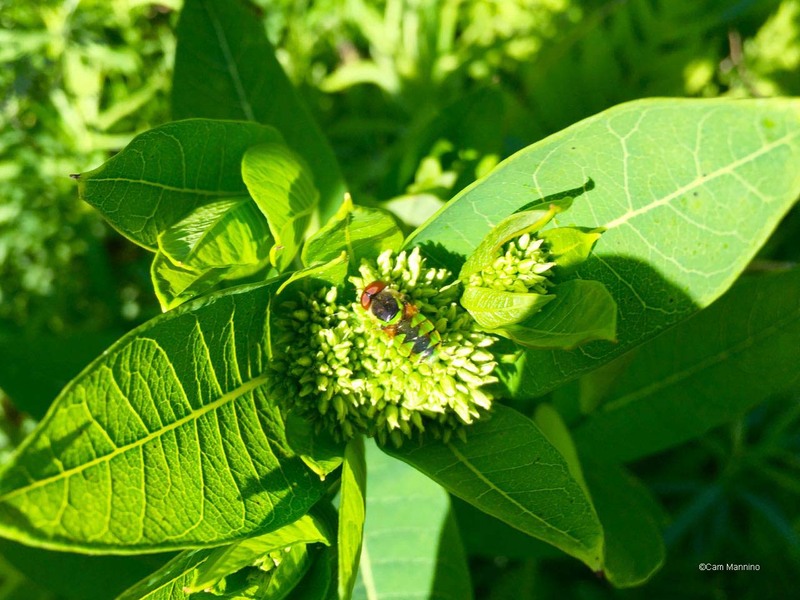 Here’s a photo of a Soldier Fly (Odontomyia cincta) exploring the Dogbane. Can you see the black chevrons on his green back and his red head? Pretty fancy, eh? 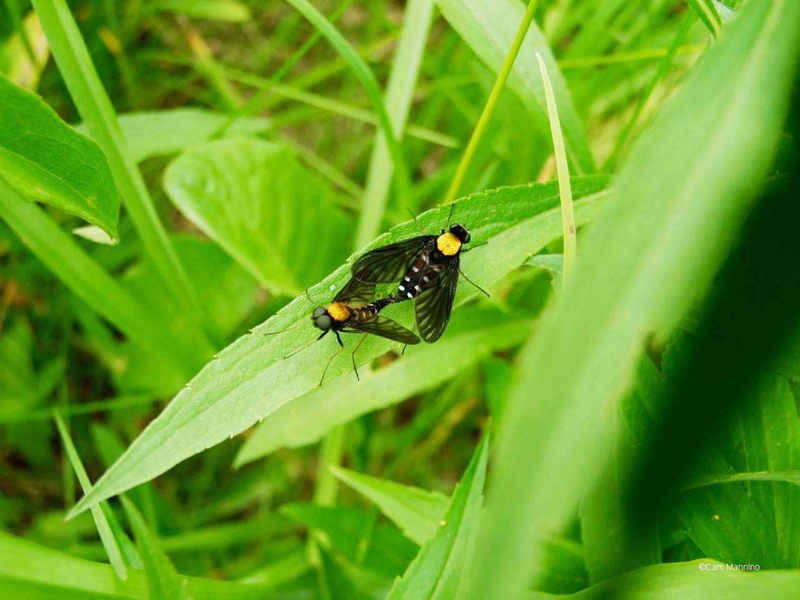 Or how about these mating Golden-backed Snipe Flies (Chrysopilus thoracicus)? The male is the smaller one with the much bigger eyes (“The better to find you with, my dear!”). Golden-backed Snipe flies mating. The smaller one with larger eyes is the male. Of course, butterflies float above these fields as well. 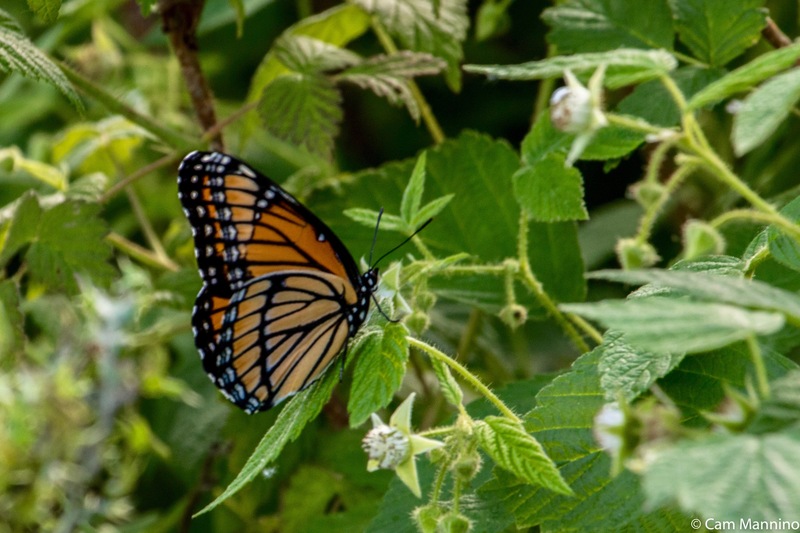 This weekend we saw our first Viceroy (Limenitis archippus) of the year. This one had a slightly injured forewing on one side, but was still happily fluttering about the field exploring flowers. 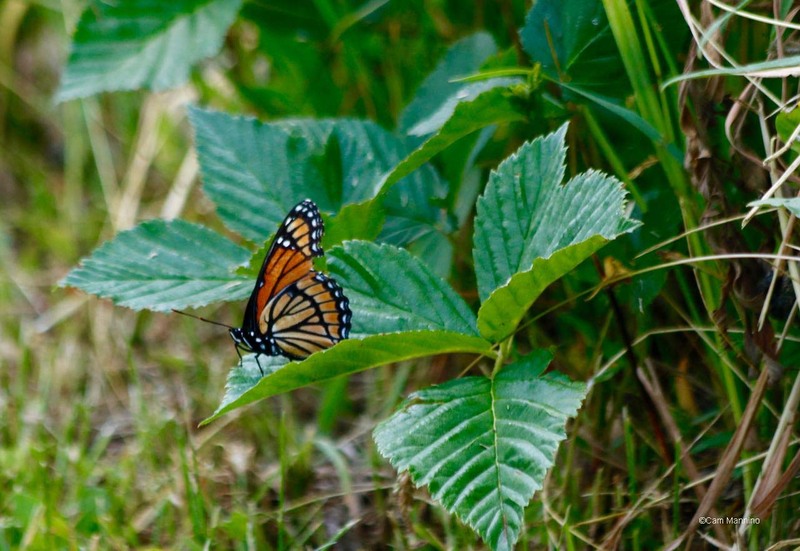 Viceroys are often smaller than Monarch Butterflies and have a telltale bar on their hindwing that the Monarch doesn’t have. What appeared to be a female Black Swallowtail (Papilio polyzenes asterius) hustled from blossom to blossom in the distance last Sunday, never alighting. So here’s an earlier photo from Bear Creek. I could, however, have seen the black form of the female Eastern Tiger Swallowtail which is very similar. 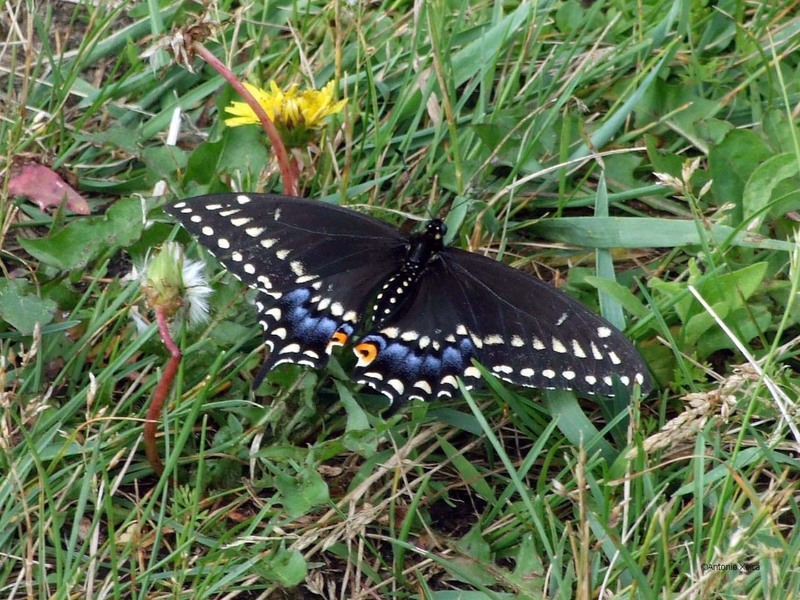 A female Black Swallowtail fluttered above the old fields at Cranberry this weekend. Or it may have been the black form of a yellow Tiger Swallowtail, too. And of course we saw the common but lovely Pearl Crescent (Phyciodes tharos), Cabbage (Pieris rapae)and Little Wood Satyr (Megisto cymela) butterflies as well. Cabbage Butterfly male. The female has two dots on the upper wing. One afternoon I saw a quick, snapping, short flight of what looked like a big moth with yellow-ish wings. It turned out, after I saw it land, that it was a Carolina Locust in flight. 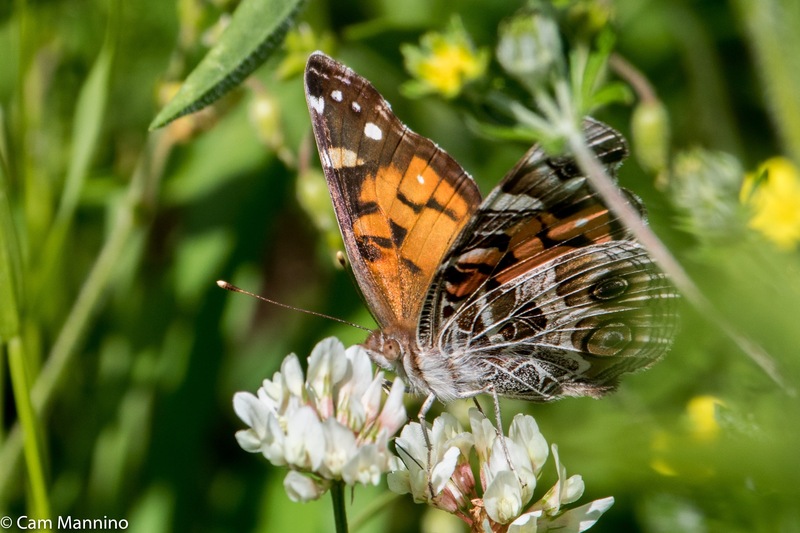 The “Bug Lady” at the University of Wisconsin-Milwaukee website says that “In The Handy Bug Answer Book, Dr. Gilbert Waldbauer refers to these unexpected wing patterns as ‘flash colors’ which, sometimes in concert with flight noises, attract/distract a predator. When the grasshopper lands and tucks in its flying wings, the pursuing predator suddenly can’t find anything that matches its search image.” That was certainly the case for me. It took me a minute to believe that this brown creature at my feet was the one I’d seen flying. Here’s a link where you can scroll down to a photo of one in flight. 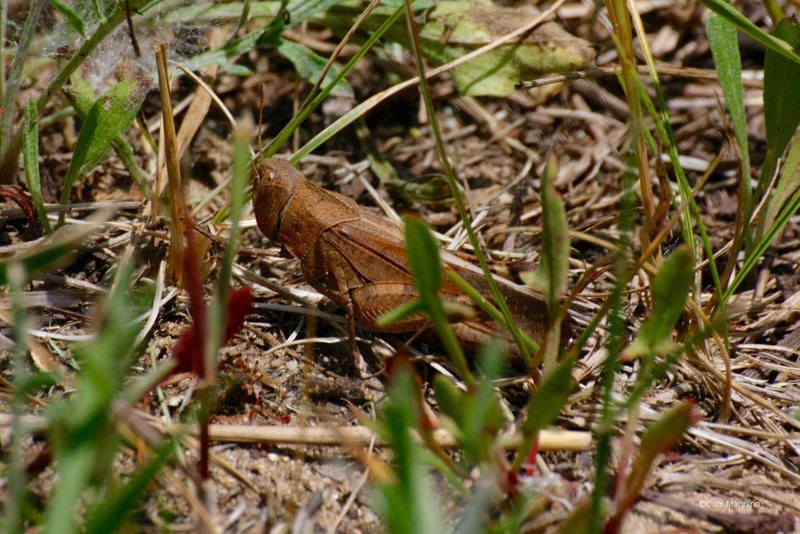 The Carolina Locust who shows “flash colors” when it makes a short flight to escape predators and then disappears in the grass. Walking on shady paths and passing by wetlands, I naturally come across plants, insects, birds and other creatures that prefer that environment to sunny, open fields. 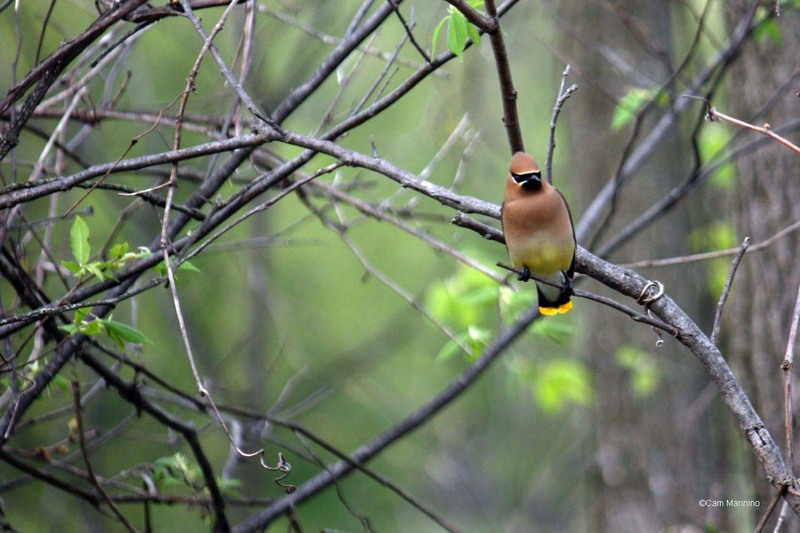 Two Cedar Waxwings landed up in a leafy treetop on Sunday afternoon. My photo that day just doesn’t do justice to this lovely bird, so here’s a photo from another summer. The field marks of this elegant bird are its crest, its black mask, the yellow tip to its tail and a red dot on each wing that looks like red sealing-wax. And their color does look like cedar, doesn’t it? The field marks for a Cedar Waxwing are red wax-like dots on each wing, the black mask, the yellow tip of the tail and a soft crest. 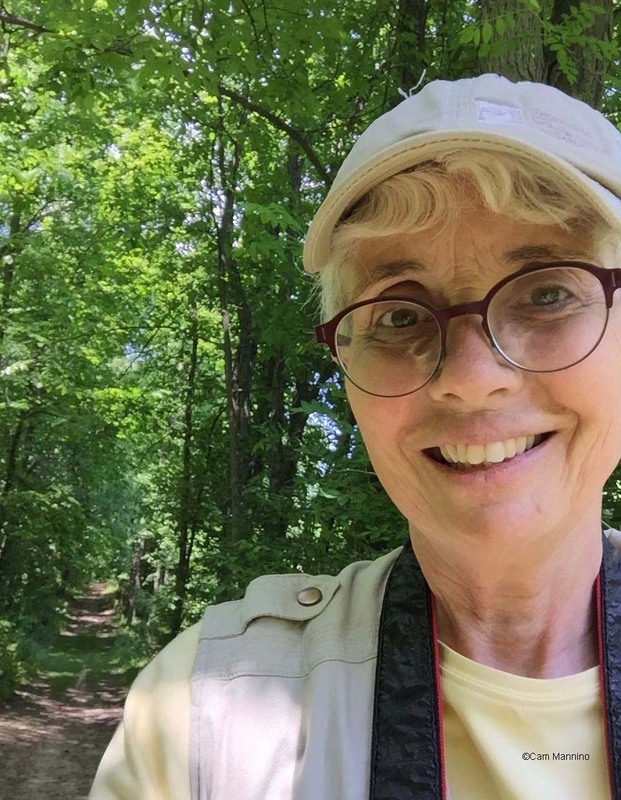 Down near Cranberry Lake, three of the Wednesday birders recognized the melodious tune of the Warbling Vireo, here recorded by birder Antonio Xeira. What a lovely song flowing down from the treetops where it stays out of sight, seeking out caterpillars. I love the contrast in these two song descriptions found at the Cornell Lab website. “The early twentieth century ornithologist William Dawson described the song this way: ‘Fresh as apples and as sweet as apple blossoms comes that dear, homely song from the willows. 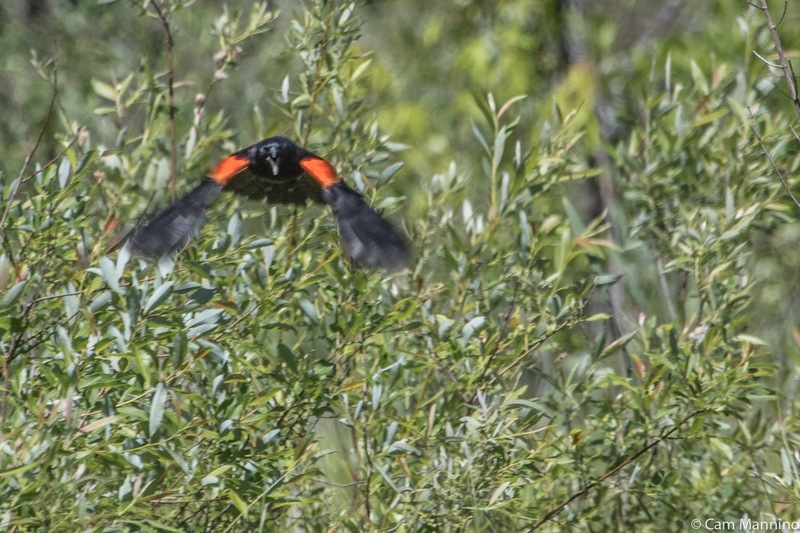 '” The highly variable song usually ends on a high note, leading the birder Pete Dunne to describe it as sounding “like a happy drunk making a conversational point at a party.” Here’s the closeup photo at Cornell Lab. 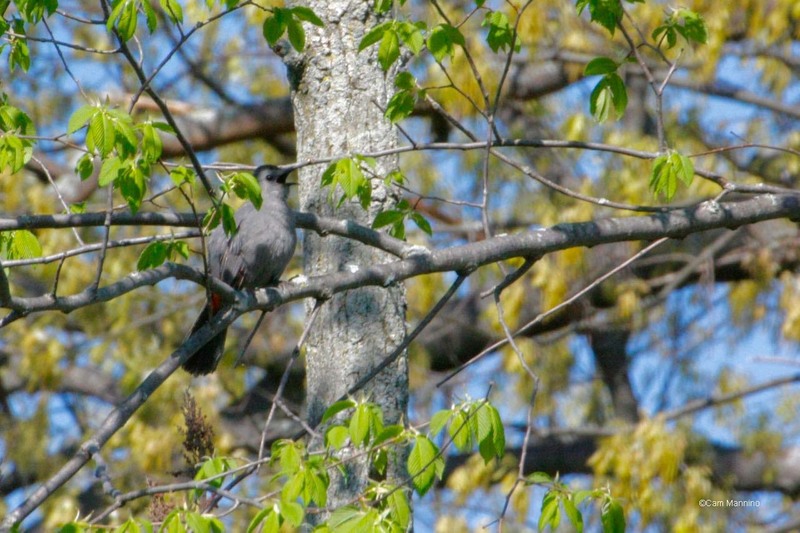 An incredible songster, the Gray Catbird (Dumetella carolinensis) makes a pastiche of other birds’ songs and strings them together. 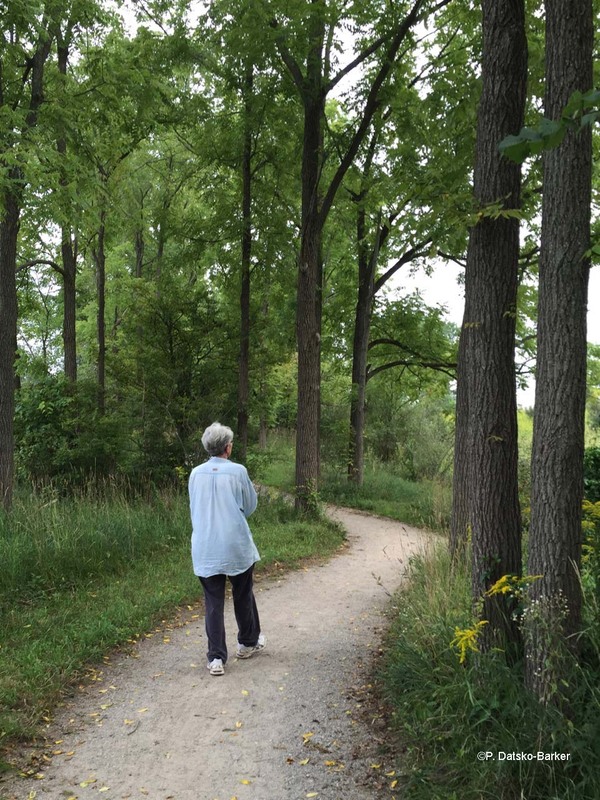 Walking past dense, low foliage, you can often heard him singing his avian version of “sampling,” as in this 45 second recording Antonio made on the Paint Creek Trail. Frogs generally love moist surroundings. 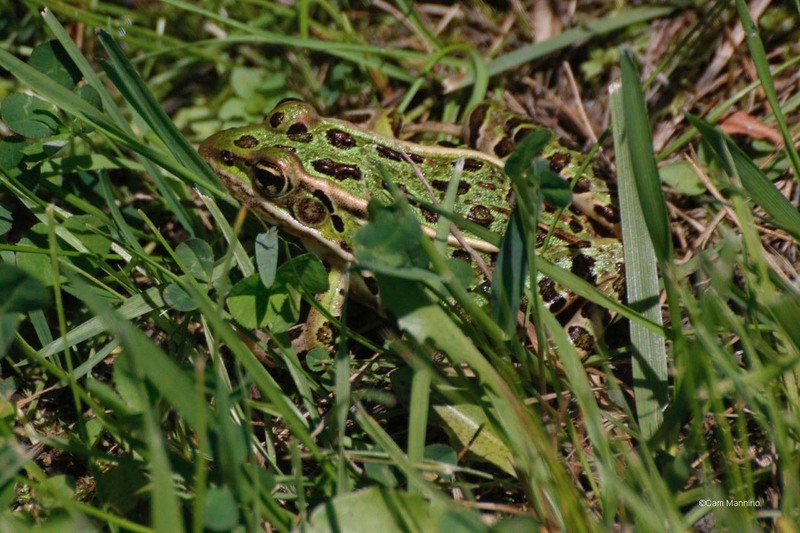 In summer, though, the beautiful Northern Leopard Frog (Lithobates pipiens) often moves into grassy areas for its meals. One paused at the edge of the trail at Cranberry Lake Park, an emerald green frog with golden eyes and the spots that give it its name. Northern Leopard Frogs have very large mouths and though they usually eat worms, flies and crickets, they have also been known to swallow birds and garter snakes, according to Wikipedia! Not hard to imagine how the Northern Leopard Frog got its name! 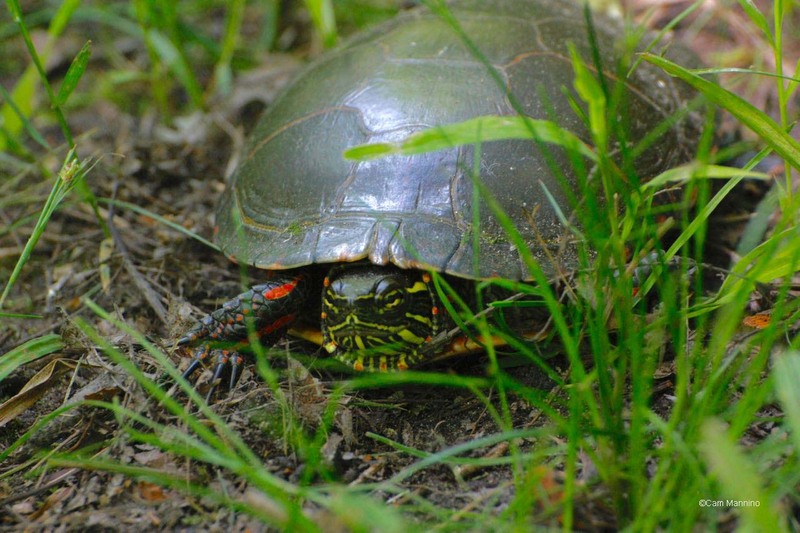 One warm afternoon, I came upon a Painted Turtle trundling along the path toward Cranberry Lake. A Painted Turtle heading back to Cranberry Lake, perhaps after laying eggs in the sandy field? I thought at first it was a male, because it had extra long nails which males use to stroke their mates. But I’m not sure, since it may have been a female coming back to the lake from laying eggs in sandy soil out in the fields. 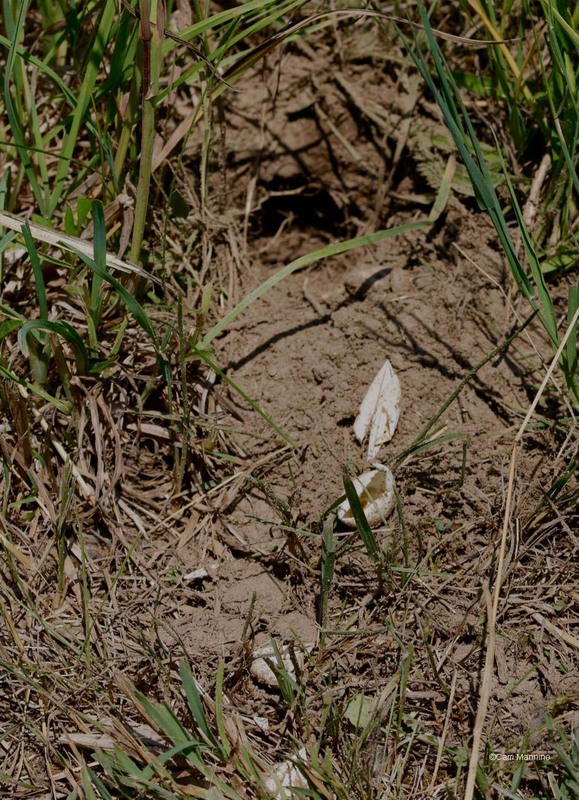 A few days later, my husband and I spotted a hole in the meadow edge where it appeared a raccoon might have dug up a batch of turtle eggs to feed its young! What appears to be the remains of Painted Turtle eggs dug out of the ground by a raccoon or other hungry animal with young..
Cranberry Lake is of course important because it has a cranberry bog. At the moment, it’s not visible, but the Parks and Recreation Commission’s Master Plan includes construction of an observation deck at the lake in the next couple of years. But other berries are forming along the shady path toward the pond. The native Bristly Blackberry bushes are blooming under the trees. In fact, their flowers are beginning to fade in the heat and the fruits, the blackberries, are forming. 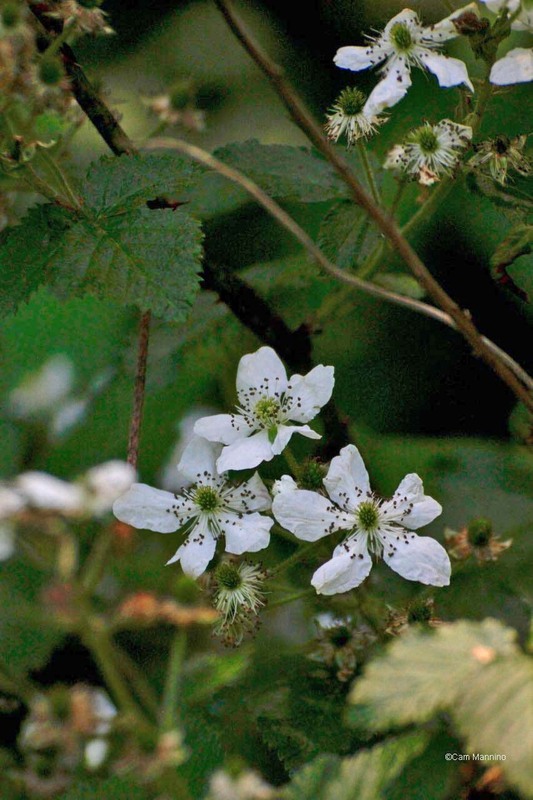 Bristly Blackberry blooming on the shady path leading to Cranberry Lake. 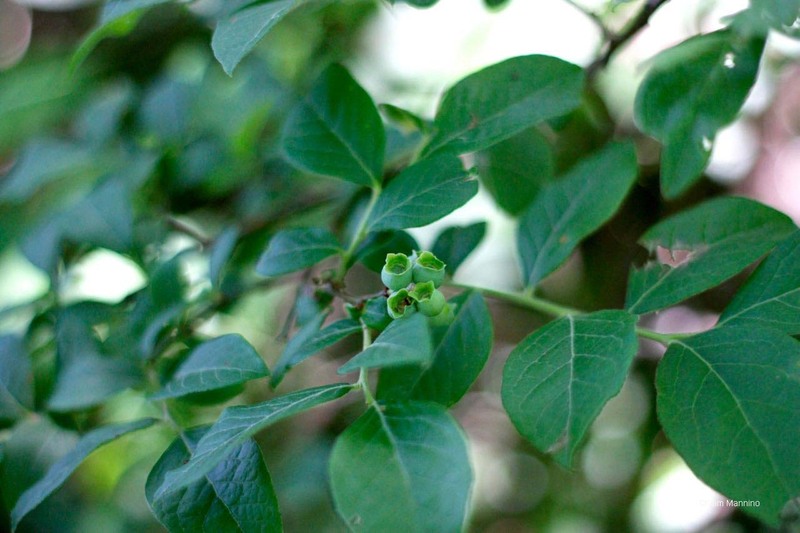 Native highbush blueberry is the plant stock from which the domesticated blueberries we eat were derived. 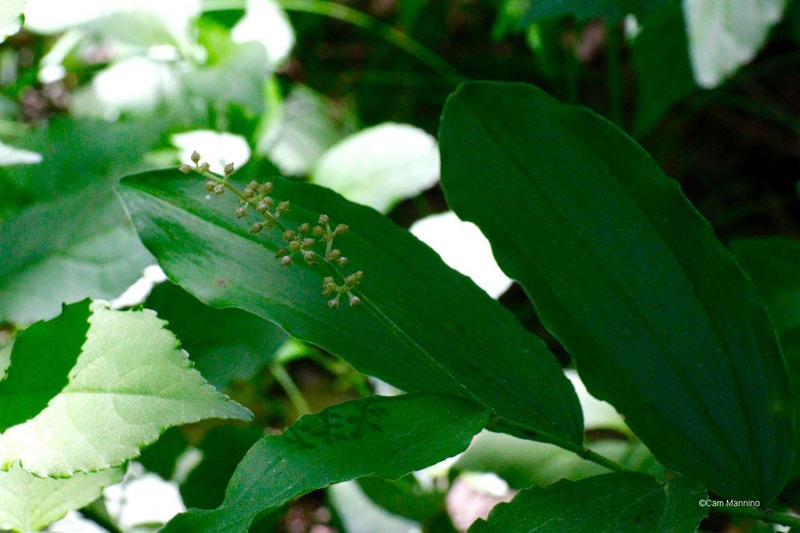 Along the Hickory Lane on the west side of the park, I saw fruits forming on False Solomon’s Seal, a native plant that spreads by rhizomes (underground stems) under the trees. 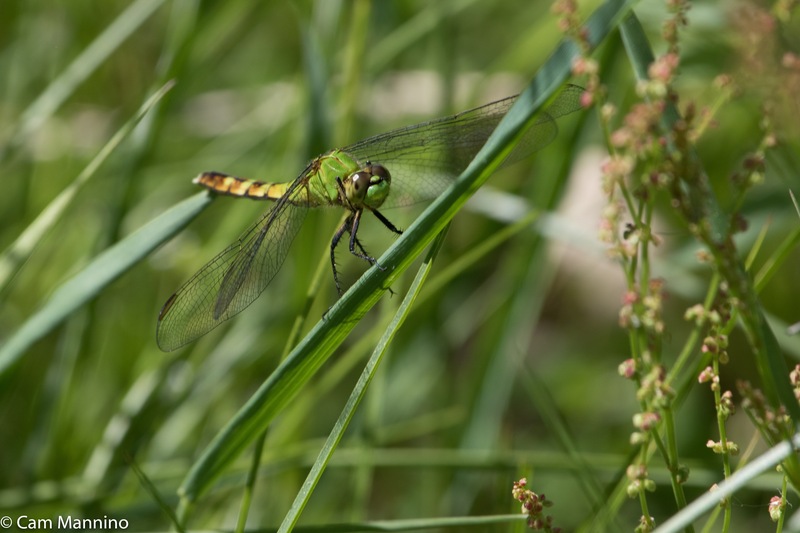 Dragonflies patrol along the shady paths as well as the open meadows. I saw one last week that I hadn’t seen for a long time, a female Eastern Pondhawk (Erythemis simplicicollis). She’s emerald green all over with brown/black chevrons on her tail. According to the “Bug Lady” at the University of Wisconsin Milwaukee, the male gradually changes from green to blue, starting at the tip of its tail and moving up as it matures! These dragonflies stick close to animals, like us, because we stir up a cloud of biting insects they love to eat. Thanks, Pondhawks! Enjoy an all-you-can-eat feast! 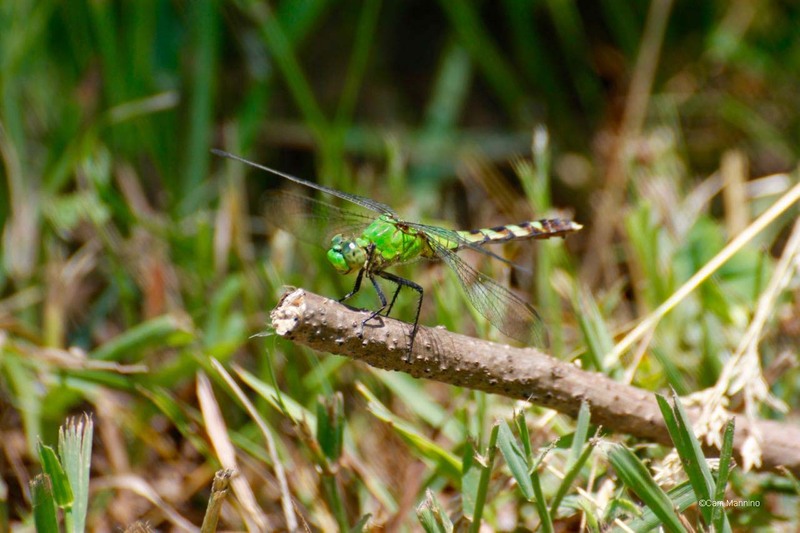 A female Eastern Pondhawk dragonfly is emerald green, unlike the male who changes from green to blue as it matures. Another dragonfly who seems to frequent moist areas almost exclusively is the Dot-tailed Whiteface (Leucorrhinia intacta). The male looks like he’s wearing a Mickey Mouse mask with his white face and eyes. What I think was his mate landed nearby. I couldn’t see her white face but all of her tail and wing markings and her location near the male would seem to indicate she’s the female. A male Dot-tailed Whiteface dragonfly with a comical Mickey Mouse-ish white face. I think this is a female Dot-tail from her wing and tail markings but couldn’t see her face before she flew. Damselflies also patrol the paths as you near Cranberry Lake itself. Emerald green seems to be a popular color for creatures who want to disappear from predators in the shade. Here’s one called, appropriately enough, the Emerald Spreadwing Damselfly (Lestes sponsa). Below the huge Shagbark Hickories (Carya ovata) on the lane at the western edge of the park, a Virginian Ctenucha Moth (Ctenucha virginica) sailed past and settled on a leaf. I was quite excited to see this moth (which caused a slight blur in the photo), since Ben had helped me identify its spiky caterpillar earlier in the spring. It’s quite common and likes goldenrod nectar. This one might have hatched a bit early in the heat, since the goldenrods won’t bloom for another month. This elegantly shaped moth with an orange head flashes its metallic blue body when it flies. 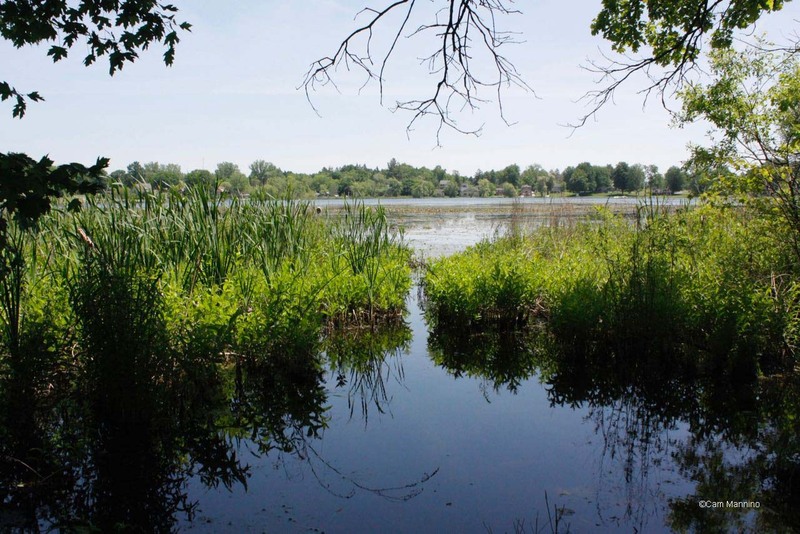 Improvements continue at Cranberry Lake Park. The northern most part of the central trail that connects with trails in Addison Oaks county park is being renovated this year (and possibly next) to make it less damp so that hikers, bikers and horseback riders will have an easier time accessing the park. That northern section is full of wetlands, those precious resources that clean our groundwater, store flood waters, feed our wildlife and give shelter to exhausted migrating birds – but they make for wet trails in the spring. But most of the park is open for your enjoyment year ’round with migrating warblers in the spring, breeding birds in the summer (and summer concerts on the farmhouse porch), a bright orange glow in late summer and fall as Canada Goldenrod bloom and Monarch butterflies fill the fields traveling south. In winter, its gently rolling meadows might be a place to try out your cross-country skis. And then there’s all that history near the Flumerfelt Barn and historic home. So branch out. Try a new park this summer and see what you and your children can find to love at Cranberry Lake Park.